Understanding your legal rights when you homeschool your special needs child. Advocating for additional rights. Area-specific support may also be on your Regional page. Just because a child has been determined to be a special needs child and an IEP has been prepared for her, does not mean that her family loses their constitutional right to choose the best educational alternative for their child. Parents can elect to place their child in a private school or facility. By Linda J. Conrad Jansen, Esq. If you are like many parents, when you receive a telephone call or letter inviting you to an IEP meeting, you respond with anxiety. Few parents look forward to attending IEP meetings. From the U.S. Department of Justice. Resources available through the government. This association is a network of attorneys and legal experts that are concerned with litigation pending and threatened against homeschoolers. Moderated by Linda J. Conrad Jansen, an attorney and Legal/Legislative Chair of the HomeSchool Association of California. 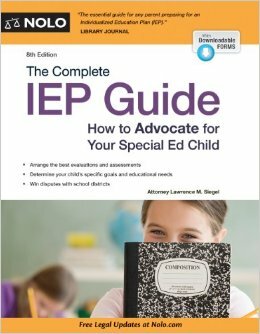 – resolve disputes with your school districtWhether you’re new to the IEP process or entering it once again, this user-friendly, plain English guide is your outline for an effective educational experience for your child. You’ll get all the forms, sample letters, and resources that you could possibly need at any stage of the IEP process. Low cost Advocacy Package available through Wright’s Law can help you determine your need for legal assistance. California: Is it possible to homeschool a child with special challenges? Might that child even flourish? From HSC. California: Even though you have voluntarily placed your child in a “private school” you still have some rights to special education services. If in a charter school – You request special education services, in writing, from the principal or director of the charter school and the assessment procedures and services received would be the same as if you are in a public school. Connecticut: Long list of special needs state resources from the Connecticut Homeschool Network. Illinois: As a parent of a child with special needs, you can receive special services from your school district at no further cost — you have already paid for them with your taxes. This includes speech therapy, physical therapy, occupational therapy, audiologists’ and social workers’ services. These are all covered by Public Law 94-142. Massachusetts: Eligible Massachusetts homeschoolers still have right to special services through the public schools if they desire them. But if a homeschool parent does not provide consent for an initial evaluation or a reevaluation, the school may not override that decision and is not required to consider the child eligible for services. AHEM. Nevada: Unlike a public schooled child, not every homeschooled child is entitled to receive services. For those homeschooled children who do receive services, with final determination by the local district, a service plan is developed (similar to an IEP), and services are provided. Lots of good advice. New York: PICC has answered hundreds of phone calls, mailed out thousands of pieces of literature, and helped parents of handicapped children throughout New York State find resources and network with other families who have decided to home school their child with special needs. Oregon: State law provides that children with disabilities be evaluated for “satisfactory educational progress according to the recommendations of an individualized educational program (IEP) or privately developed plan (PDP). What rights do home school students have for special education services from the local school district? Tennessee: Students who are home schooled are entitled to the same services as children who are placed in private schools by their parents. This is provided via a “services plan” and is generally some type of related service, such as speech therapy, as determined by the school district where the student is registered to home school. The parent should contact the local school district for complete information. Texas: Families who have children with special needs have the same rights in Texas as families who have children with typical learning abilities. Individuals with special needs are not required to attend public school. Virginia: My child has a current IEP. I know he is entitled to received speech services, but I how do I proceed? VA Homeschoolers. Washington: The good news is that Washington’s home-based instruction law does not discriminate! It was written to include ALL kids in the state with no extra hoops to jump through for those with extraordinary challenges. WHO. If you are aware of a “special needs and homeschooling” site in your state that I have missed, please leave its name, link and a brief description in the comment field below. Who also have keen understanding of state homeschool law. The Firm’s practice is limited to the representation of disabled children and their parents in matters involving disputes with New Jersey school districts. If you are an attorney with a gift for supporting the parents of special needs children, and would like to be listed here, please leave a comment below with a link and your relevant qualifications and the area you serve. Please also indicate your experiencing with homeschooling. Learning Problems at School: Whose FAULT Is It? If services are offered, the family is not required to accept them. Many families do just fine without government help, but if you need it, special needs services are available to homeschoolers. By Linda J. Conrad Jansen, Esq.